If Shotgun Kowboy is going to make his mark on Oklahoma Classics history Friday night at Remington Park, he will have to defeat four rivals while breaking from the outside post position, number five, in the 1-1/16 miles event. Shotgun Kowboy is attempting to win his third $175,000 Oklahoma Classics Cup, the richest event on the $1,000,000 Oklahoma Classics Night of stakes events for eligible Oklahoma-bred Thoroughbreds. Bred, owned and trained by C.R. Trout of Edmond, Okla., Shotgun Kowboy won the Classis Cup in 2015 and in 2017. A third victory in the race would put him alongside Mr Ross (1999-2001) and Zee Oh Six (2002, 2005-2006), as the only horses to capture the top event in the series three times. Jockey David Cabrera receives the call on Shotgun Kowboy for the first time in the 6-year-old gelding's career. A son of Kodiak Kowboy from the Siphon (Brz) mare Shotgun Jane, Shotgun Kowboy has earned $1,267,501 overall with 12 wins (seven at Remington Park), five times finishing second and another five races where he was third. He will make his 31st career start when he leaves the gate on Friday night. Shotgun Kowboy is the first horse to win the Grade 3, Oklahoma Derby (2015) and then win the Oklahoma Classics Cup. The Classics series started in the fall of 1993, shortly after the legendary Oklahoma-bred Clever Trevor had retired. Clever Trevor is the only other Oklahoma-bred horse to have won the Oklahoma Derby, known as the Remington Park Derby in 1989, when he took the inaugural edition of the top event in Oklahoma. Shotgun Kowboy seeks his fourth career victory in the Oklahoma Classics. He started his career in the state-bred series with a win in the $100,000 Classics Juvenile in 2014. Only four horses have won four or more Oklahoma Classics races in its history. Highland Ice won five Classics races with Notable Okie, Okie Ride, and She's All In each winning four. Shotgun Kowboy enters the Classics Cup off a third-place effort in the $175,000 Governor's Cup behind Hence on Sept. 30. Earlier this year, Shotgun Kowboy, won the Grade 3, $200,000 Lone Star Park Handicap, defeating Mubtaahij, out of National Hall of Fame trainer Bob Baffert's barn. Mubtaahij was the winner, by eight lengths, of the Grade 2, $2 million UAE Derby in Dubai in 2015. He then competed in the Grade 1, $2 million Kentucky Derby and finished fourth to Triple Crown winner American Pharoah in the Belmont Stakes that year. Tuff Kid is among those trying to spoil Shotgun Kowboy's party Friday night. Tuff Kid raced second, beaten 5-1/4 by Shotgun Kowboy, in the Classics Cup last year. He was fourth in the 2016 edition of the race behind winner Phantom Trip, when Shotgun Kowboy skipped the event. Claimed on August 31 for $30,000 for new owner GK Racing of Driftwood, Texas and new trainer Karl Broberg, Tuff Kid is normally a deep closer in his best efforts and will add blinkers for the first time in his career for the Classics Cup. A 5-year-old gelding by Don't Get Mad from the Wild Again mare Tuff Chick, Tuff Kid will be ridden by Ramon Vazquez for the first time in his career. Making his first start in the Classics Cup will be Rowdy The Warrior, a 4-year-old trained by Donnie Von Hemel, the all-time leading trainer by wins in the Oklahoma Classics with 26. 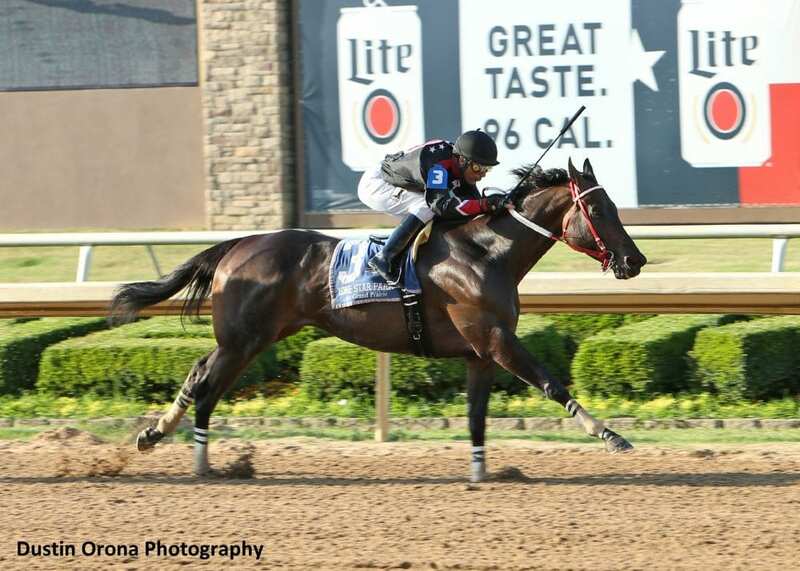 Also entering the race for the first time is Night Strike, a 3-year-old trained by Bret Calhoun who won an Oklahoma-bred allowance race at 1 mile-70 yards at Remington Park on Sept. 6. The Primetime Pick 4 wager (races 7-10) on Oklahoma Classics Night will carry a guaranteed minimum betting pool of $100,000. The wager is comprised of all stakes events for the evening. This entry was posted in NL List, Racing and tagged c.r. trout, david cabrera, Oklahoma, oklahoma classics, oklahoma classics cup, Oklahoma Derby, remington, remington park, shotgun kowboy by Press Release. Bookmark the permalink.